There’s nothing worse than working flat out for 3 days and nights on a project you think is going to be awesome, polishing it with every single program or filter you know, overheating your computer, spending good money on printing, only to find yourself presenting to the whole class and realizing your idea is actually not awesome. How could this happen?? We all have access to magazines, websites and blogs that deliver daily doses of inspiration. Our laptops have more processing power than any satellite orbiting the Earth, and there is basically no limit to the number of ‘undos’ or ‘layers’ we can add on Creative Suite. We have advantages that our contemporaries could only dream of. But that doesn’t guarantee our ideas are better. Sometimes, the best way to produce the best work is to ignore these advantages and go back to basics. 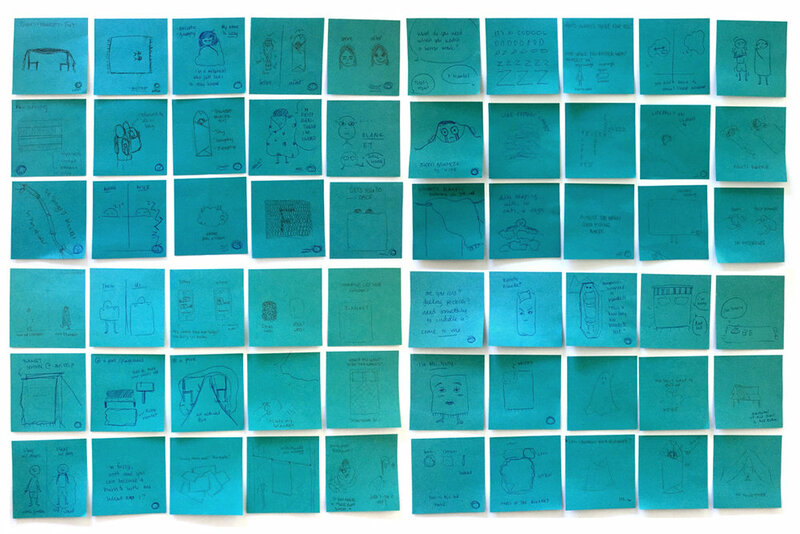 Sometimes, a pen, some post-it notes, and two productive hours can do more for you than technology ever can. IDEA School of Design's IDEA Challenge 2017—Fake it till you make it (Sketching overview); Close-up shown above. Give yourself a time limit and sketch as many ideas as you can. One idea per post it. You’ll cover a lot more ground than if you went directly to the computer. In the same amount of time you’d spend crafting your work using Creative Suite, you’ll have a stack of ideas to polish. Once you have that stack of ideas, you’ll have to go through it and choose the best ones. It’ll be rough, but you’ll have to put your creative thinking to work and choose the ones that best answer the brief. 3. It makes the best ones stand out. Good ideas always stand out, no matter what shape they take. If they’re clear, concise and exciting as a rough sketch, they’ll get even better once you start polishing them. 4. It can make you look good. Your sketches can look great in any presentation deck. They can show your creative process and make selling your recommended idea that much easier. Sharing your process always impresses your client and proves that you’ve put in the time to make your project as good as it can be. 5. It’s gives your brain a workout. Your first idea could be your best, but you won’t know that until you have a stack of ideas to look at. Put in the time, stretch your creative muscles and start developing habits that will serve you throughout your whole creative career. With a multidisciplinary approach that stretches from one ocean to another, I’ve strived to create award winning campaigns for some of the world’s most iconic brands. I'm always looking to collaborate on personal projects with driven creatives. Don’t hesitate to give me a shout! Dominic joined the faculty of Capilano University's IDEA School of Design in 2017.